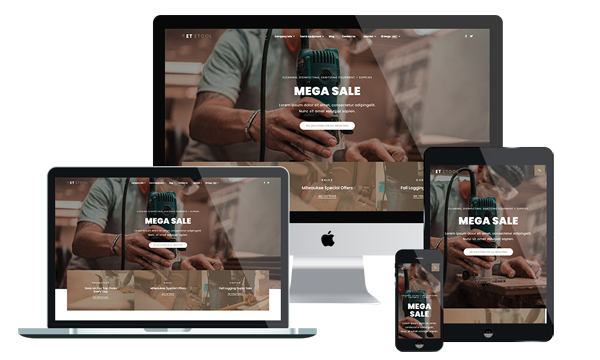 ET Etool is Free and Premium Responsive Equipment WordPress Theme which is intended to Tool Stores to sell tools & equipment through a professional online store. Tools and Equipment WordPress Woocommerce Theme builds with Genesis Framework, shopping cart support by WooCommerce. With cross-browser compatible and responsive templates your customers have the freedom to access your website on from any device and browser they choose, with no depreciation in quality. They are assured the same high quality on a smartphone as they are on a PC. You benefit from enhanced SEO by having all users go to just one location. This Equipment WordPress Theme use colors and high resolution images to attract and invite. The entire content is very well organized in specific categories so everyone can navigate easily and find the desired products. The structure is simple and big sliders are used to promote special offers and best selling products. Don’t let your viewers get bored on your site! Visit us today and choose interesting Equipment WordPress Theme for your facility company!